The film opens with live footage of The Beatles playing live in Manchester in 1963 and it’s genuinely exciting. Seeing a band at their live peak in front of an enraptured audience sends a tingle up the spine. In fact all of the live footage is great, even if some of the much-vaunted newly discovered 8mm fan film is a little grainy and out of focus. We even get to see some unseen footage from their last ever gig at Candlestick Park in San Francisco. But this brings us to the crux of the problem with the documentary – for a film that is supposed to be about The Beatles on tour, we don’t get to see enough of The Beatles on tour. There are some absolutely fascinating recordings of studio outtakes but they feel like they’re part of another film. 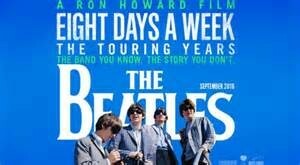 Almost as if Ron Howard was going to make a documentary about The Beatles’ full career but halfway through realised that it would be too long. Some of the talking heads also feel out of place. Howard Goodall is brilliant on music history and The Beatles place in it, especially with reference to classical music, but he’s not really someone who can talk about The Beatles as a live band. Elvis Costello feels like he’s there just because he was available when they were filming. It also quickly skirts over a few things. The fact that they were absolutely crap when they played in Japan (mainly because they didn’t bother rehearsing because usually no-one could hear them over the screaming) is only briefly mentioned by Ringo. Also, the final US tour took place in half-full stadiums after Lennon’s “bigger than Jesus” remarks. The backlash is covered but the decline in ticket sales barely mentioned. Having said that there are still some interesting things in this film. Seeing The Beatles at press conferences just shows how much of a gang they were and just how funny they could be (although we don’t really need Eddie Izzard as a talking head to point that out to us) Meanwhile, American journalist Larry Kane offers some genuine insight of what it was like for The Beatles on tour as he actually tagged along with them. It was also remarkable to discover that The Beatles refused to play to segregated audiences in America, even going as far as refusing to play in Jacksonville before it was changed. The final shots are also great – The Beatles playing live for the last time. After three years away from performing live, they take to the roof of the Apple building on Saville Row in London and bring part of the city to a standstill. Filmed as part of the Let It Be film and with Billy Preston in tow, the band still have “it”. Would the ’80s have led to a big money reform tour? So, there are the bones of a good documentary in there somewhere, it just needed a bit more focus. It almost completely ignores the early years of gigging in Liverpool and especially Hamburg where The Beatles really earned their chops. Klaus Voorman would have made a far more interesting talking head than Whoopi Goldberg. Bearing in mind that all four Beatles retuned to the live arena following the break-up of the band, it would also have been interesting to see if there was any footage of that or any interviews where they talk about it. Seeing the film in the cinema, we’re treated to two bonus exclusives. The first is a love feed from the red carpet event at the world premiere in Leicester Square in London. Frankly, this is awful – watching John Bishop interview Yoko Ono is just cringe-worthy. She has no idea who he is and he is one of the least natural interviewers I’ve ever seen. After the film, we’re treated to a recently re-mastered version of The Beatles at Shea Stadium and this is a real highlight of the evening. Someone like One Direction should be shown this to see what being famous really is and to see what it’s like to have girls screaming through your entire set. In 1979, The Clash told us that phoney Beatlemania had “bitten the dust”. Watching Eight Days A Week, it doesn’t appear phoney at all, it seems like the real thing. However, while watching the band play live is often thrilling, overall the documentary is too unfocused to be a real classic. The final live scene of the band playing on a London rooftop exposes the elephant in the room – until Let It Be finally gets a proper release, things like this will feel a little like money-grabbing filler. Even though the film does have the slight whiff of being made by the “Apple committee” – we don’t see the warts never mind the all, it is always exciting to spend a few hours in the company of The Beatles. With a bit more single-mindedness, it would have made an interesting addition to The Beatles’ cannon. As it is, I doubt that it’s a film that Beatles’ aficionados will be watching with any great regularity.